CUPERTINO, California—March 22, 2011—Apple® today announced that iPad® 2, the second-generation of its third post-PC device, will go on sale in 25 additional countries this Friday, March 25. iPad 2 will be available at Apple retail stores and select Apple Authorized Resellers at 5 p.m. local time, and online through the Apple Store® (www.apple.com) beginning at 1 a.m. Apple today also announced that all models of iPad 2 will be available in Hong Kong, Korea, Singapore and additional countries in April. iPad 2 will be available in Hong Kong, Korea, Singapore and additional countries in April, and in many more countries around the world in the coming months. Further international availability and pricing will be announced at a later date. 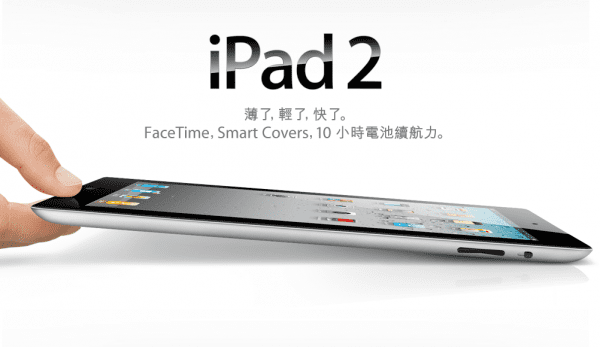 根本無可能, 因為 Apple ipad 2 嚴重缺貨, 而家 Apple online order 都要等 4-6 個星期。 佢o地都搵個藉口唔俾貨日本啦, 點會4月俾香港, 南韓, 新加坡呀?